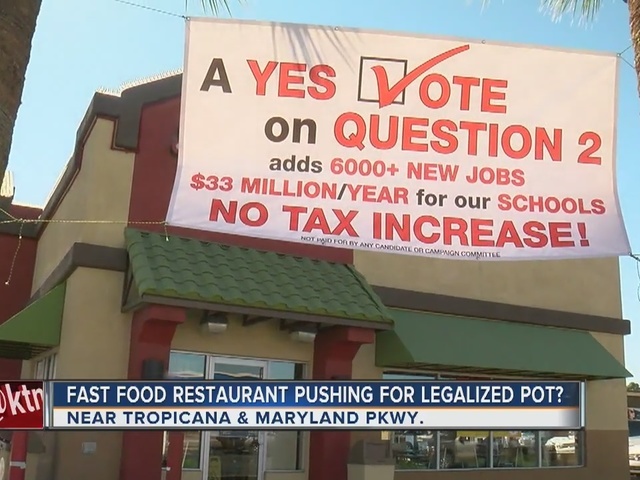 The sign supports Question 2 outside the restaurant near Tropicana Avenue and Maryland Parkway. A fast food restaurant near UNLV appears to get political as a way to help business, but not everything is as it seems. 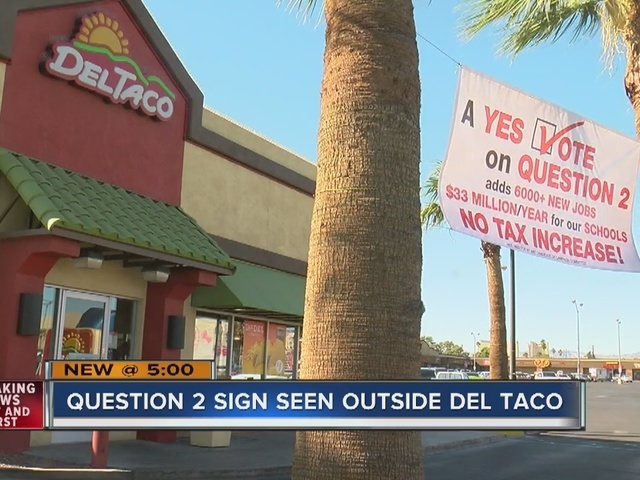 A banner was outside the Del Taco at Tropicana Avenue and Maryland Parkway for two days, urging people to vote yes on Question 2. That's the question to legalize recreational marijuana, and it shouldn't be too much of a stretch to imagine why Del Taco might want it to pass next week. The connection was obvious to college students we spoke with. "You just get the munchies," said Anthony Iannuzzi, a UNLV junior. "But I don't smoke weed." Jorge Ortiz is a freshman at UNLV who used to work at a Taco Bell. "People would come in their packed cars and they'd look faded and they would order a ton of food," Ortiz said. "Like not even joking, $50 worth of food." When we asked the manager about the banner, she didn't know who put it up. She took one look at it and immediately called her supervisor. It wasn't long until employees came out with a ladder and cut the sign down. Iannuzzi thought that was the right decision. "If I was in charge with Del Taco, I probably wouldn't be doing that," he said. It remains a mystery as to who put the sign up. We didn't hear back from Del Taco's corporate office, and we couldn't get in touch with the owner of the shopping center.